Nintendo has released System Menu 4.1 in Japan. Nintendo released a Wii Firmware update, version 4.1 today in Japan. A bug fix to Wii Sports Resort, in which after playing a WiiWare/VC game off the SD card,and then playing Wii Sports Resort afterward, you would be forced to watch thehow-to Wii Motion Plus video that normally plays only once on the initial playof Wii Sports Resort. The usual warnings apply, updating is not recommended until more information is known about its effects on homebrew.Bannerbomb’s is still working! You may check updates via Wiimposter Logs. Version 4.1 of the System Menu was built on June 24th, 2009 and released on July 3rd, 2009.
batman52 made an interesting comment in the previous post: WiFi. Indeed, much to my surprise there are miniSDIO WiFi cards on the market. The JZ4740 docs says that the SD/MMC controller supports SDIO, so in theory it should be possible to add WiFi to the A320. Of course this is a long shot and there are much more important things yet to get working, but just imagine the possibilities… I just have to give it a try. I think it is worth investing some of the donated money in purchasing one of these cards. What do you think?. According to recently filed FCC documents, the PSP Go (PSP-N1001) might be faster than we originally expected. 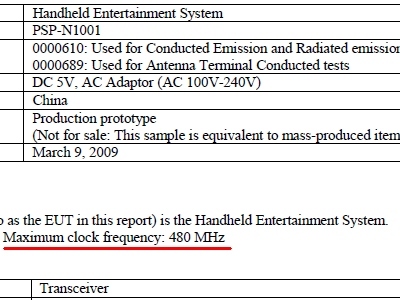 While the official specs stated the clock frequency of the processor at 333MHz, FCC documents have pegged this tiny UMD-less, flash based dynamo to actually max out at 480MHz. While the PSP Go will most likely be locked in at 333Mhz, it is possible that the software within will allow scaling for intensive applications or the full speed will be enabled in a future firmware update. Many of you may remember that the original PSP was always locked to 222MHz, but since firmware 3.50, developers had access to the full 333MHz. The difference in increased processor speed was night and day for many gamers, who noticed better lighting, more particles, and a few minor differences. What will a 480MHz PSP Go bring to the table?